After reading so many rave reviews of The Winter Sea I feared my expectations would be too high and I'd be disappointed but I discovered my fears were groundless and from the beginning I was captivated . 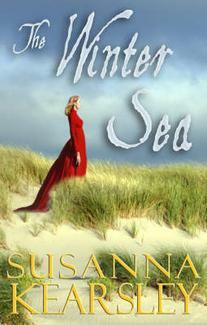 Susanna Kearsley's writing breathes vivid life into both her characters and the Scottish setting - past and present . ﻿Quite often I find myself drawn more to the historical period in these time-slip novels but this time I enjoyed each of them. ﻿As appealing as the romances are what I enjoyed most was the history. In the spring of 1708 , an invasion fleet of French and Scottish soldiers nearly succeeded in landing the exiled James Steward in Scotland to reclaim his crown. It's an event that has been largely overshadowed by later Jacobite uprisings and one I knew little about. A great deal of research has resulted in a fascinating account of those involved, including the Errolls of Slains Castle, the preparations and the dangers they faced in their determination to bring home their rightful king. ".......the growing things must die and lie in silence under snow, just as the winter sea must wear its face of storms and death and sunken hopes, the face ye so dislike. 'Tis but the way of things...."
A beautiful and haunting tale that will appeal to both romance and historical fiction readers. I loved it! I recommend. I read this book last month and also enjoyed it. So glad you enjoyed it -- it was a favorite of mine last year. Have you read Mariana by Kearsley? That's another very good one! Not heard of this one but sounds like my kinda novel. I am off to Scotland for the first time soon and this sounds like the perfect hol read. I loved this one, too! One of my favorite reads last year! Carol...I hope you will enjoy it too. Joanne...I haven't read Mariana - I liked The Shadowy Horses but Season of Storms not so much. Yay! I am so glad that you loved this one! I have been one of the people raving about it! Cat, I started reading this book and I was looking for a picture of this area and the castle online and my favorite picture that I picked out was the one of the castle from your blog! Is that not a coincidence :) I was thinking could this be "Cat"? It is beautiful! AND I'm loving the book. I didn't even know you had reviewed it.